Summary: "When a virus makes everyone over the age of eighteen infertile, would-be parents are forced to pay teen girls to conceive and give birth to their children, making teens the most prized members of society. When Melody is finally matched with the world-famous, genetically flawless Jondoe, both girls’ lives are changed forever. A case of mistaken identity takes them on a journey neither could have ever imagined, one that makes Melody and Harmony realize." 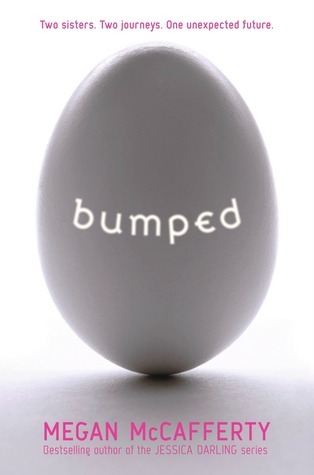 Thoughts: Around the blogosphere, I'm sure you've been reading/hearing mixed reviews about BUMPED. It's not the "normal" read, but what's so great about being normal? Before you judge it from what others say, I highly recommend checking it out for yourself. Personally, I found BUMPED to be captivating, provocative, hilarious, and a bit terrifying, all at the same time. The story alternates from Melody and Harmony's points of view. I won't bother you with details of what the story is about. If you've read the summary above, you already have an idea. Plus, anything I give away might spoil it for you. What I will do is tell you how BUMPED had me questioning what I would do if I was put in either Melody or Harmony's situation. Megan's world building is impeccable. Most dystopian novels (though amazing) leave me a bit irritated and left with too many questions as to why. Not BUMPED. Though I still have my fair share of questions, at least it's not to the point of utter frustration. I will say that some of the dialog (and lingoes) were a bit confusing to me. Eventually, I did get use to it. Who knows, maybe the word bumped itself will become the latest thing to say. "Who are you bumping with now?" Please don't ever really say that! And, of course, there's Zen. Is he swoon-worthy? You bet! He's Melody best friend, as charming as his name sounds, and just an overall riot. Oh, how I adored his humor and every single scene he was in. Honestly, Zen is one of the main reasons I can't wait for BUMPED's sequel to release. What can I say, I just love him so! Overall, Megan McCafferty has done it again, writing another entertaining and comical read. There are quite a few sexual references in this book, so I would recommend it to older YA readers. Did I enjoy it more than her Jessica Darling series? I don't know. But it's definitely in the running with Perfect Fifths! I really liked the last third and it made me interested in the sequel but I didn't enjoy it as much as you did. I do think it's a book that will get people talking which is always good. I still have to read this one! I have it as an eGalley :) I have Sloppy Firsts, but haven't gotten around to it yet. But everyone says it's amazing so I really should give it a try :D. Nice review and I can't wait to start reading Bumped! Oh I want to read this one soon! @iLuvReadingTooMuch- I love reading too much, too! The Jessica Darling series is amazing. You must read it once you get the chance!